Hi there, on your features page it says you can mark goals with red, amber or green ‘traffic light’ dots to indicate urgency. I can't work out how to do this. Can you help please? 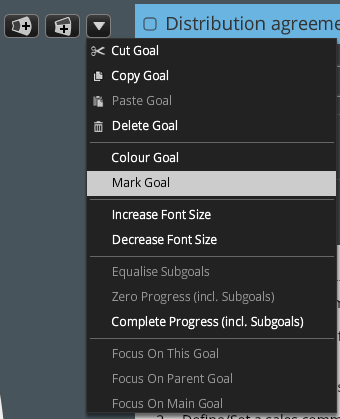 The 'Mark Goal' option is in the Goal Edit drop-down menu: click the down arrow at the top of the screen next to the 'Add Subgoal' and 'Add Neighbor' buttons (see attached screenshot). Selections made in this menu apply to the selected goal.